Robert Józef Kubica (Polish pronunciation: [ˈrɔbɛrt kuˈbit͡sa] ( listen); born 7 December 1984) is a Polish racing driver who is currently racing for the Williams F1 team. He became the first Polish driver to compete in Formula One. Between 2006 and 2009 he drove for the BMW Sauber F1 team, promoted from test driver to race driver during 2006. In June 2008, Kubica took his maiden Formula One victory in the Canadian Grand Prix, becoming the first Polish driver to win a Formula One race. That season he led the championship at one stage, before finishing fourth overall, his best career position. Kubica drove for Renault in 2010 and was set to remain with the team in 2011. Several years later Kubica confirmed he had signed a pre-contract for the 2012 season with Ferrari, a move that was eventually cancelled by his devastating rally crash in the winter of 2011. On 6 February 2011, Kubica was seriously injured in a crash at the Ronde di Andora rally, in which his right forearm was partially severed. He was taking part in the rally for personal enjoyment. Kubica told Italian newspaper La Gazzetta dello Sport in a bedside interview that he could feel the fingers in his right hand and was determined to make a swift return to Formula One in 2011. Since his return to good health, however, he initially stated that a return to Formula One would be "nearly impossible" because of his injury. Since then, he has taken part in tests with Renault and Williams, admitting that a Formula One return in the near future was not impossible. On 16 January 2018, it was announced that Kubica would become the reserve driver of Williams for the 2018 season. Kubica returned to racing in September 2012, winning a minor rally in Italy. Kubica was named one of "The Men of the Year 2012" by Top Gear magazine for his return to auto racing. In 2013, he drove for Citroën in the European and World Rally-2 Championships. He went on to win the inaugural WRC-2 title, and moved to the WRC championship full-time in 2014, driving a Ford Fiesta RS WRC prepared by M-Sport. On 22 November 2018, Kubica was announced as a Williams race driver for the 2019 Formula One season. Kubica developed his love for all kinds of cars at the young age of four when he spotted a small off-road vehicle, powered by a 4 bhp (3.0 kW) petrol engine. After long talks with his parents, his father Artur bought him the car and young Kubica spent long hours driving around plastic bottles. When he got older it became apparent that he needed better equipment, so his father bought him a go-kart. However, Kubica was too young to start racing in the Polish Karting Championship as he was under the age of ten. When he entered the championship, he won six titles in three years. After his third season, Kubica decided to switch to a more competitive series in Italy. In 1998 Kubica became the first foreigner to win the International Italian Junior Karting Championship. Kubica also scored second place in the European Junior Karting Championship and won the Junior Monaco Kart Cup held on part of the Formula One Grand Prix track. A year later, he defended his title in Italy and also competed in the International German Karting Championship. He also won the Monaco Kart Cup for the second time in a row, as well as the Margutti Trophy and Elf Masters races. In 2000, his last season in karting, Kubica scored fourth places in both the European and World Championships. Kubica started his professional career in 2000, as a test driver for a Formula Renault 2000 car. During his first professional season in Formula Renault, Kubica scored his maiden pole position and also became a member of Renault's driver development programme. In 2002 Kubica won four races and scored a second place in the Italian Formula Renault 2000. He was also seventh in the Formula Renault Eurocup. At the end of the year he took part in a Brazilian Formula Renault 2000 race held at the Interlagos circuit. This one-off appearance resulted in a dominant win. After Formula Renault, Kubica moved to the Formula 3 Euro Series. However, his move was delayed by a road accident which left him with a broken arm, and titanium screws holding it together. At his delayed debut at Norisring, Kubica, driving with a plastic brace and 18 titanium bolts in his arm, won the race. He finished the season in 12th place. At the end of the year, Kubica won a street race in Sardinia and came fifth in races held in Macau and Korea. He ended his second season in the Formula 3 Euro Series, spent with the factory Mercedes team, in 7th position. In November 2004, he scored pole position in the Macau F3 Grand Prix, where he broke the lap record, but finished second in the race. In 2005 he won the World Series by Renault championship with the Epsilon Euskadi team, earning Formula One tests with Renault. In 2006, Kubica became the official reserve driver for the BMW Sauber Formula One team. His results in both Friday testing and private test sessions, along with the words of BMW Sauber team principal Mario Theissen, led to speculation that he would become Poland's first ever Formula One racing driver in 2007. In August 2006, Kubica's teammate, Jacques Villeneuve, complained about headaches after his accident during the German Grand Prix; he was deemed unfit to race by the team, against his own belief, and Kubica was chosen by the team management to replace him at the Hungarian Grand Prix. Kubica qualified ninth, beating his more experienced teammate Nick Heidfeld. In the race, he finished in seventh place, but was disqualified after the race for having an underweight car. Villeneuve decided to leave the BMW Sauber team soon after the race, and Kubica's position in the team for the remainder of the season was confirmed by BMW. Kubica had a disappointing race at the Turkish Grand Prix, finishing in 12th place after a mistake in tyre choice. Heidfeld, who was delayed in a first-corner accident, placed behind Kubica. In his third race, the Italian Grand Prix, Kubica finished in third position, and became the first Polish driver to appear on a Formula One podium, as well as the first Polish driver to lead a Grand Prix. He was the first driver since Alexander Wurz in 1997 to finish on the podium within his first three Formula One starts. In China, he finished 13th, again after a mistake in tyre choice. After going off track at the first turn of the race, he moved from 17th position to fifth, before pitting. He was the first to change from intermediate tyres to dry tyres after the wet track started to dry. This decision was made too early: a very slow next lap in extremely wet and slippery conditions and another pit stop to change back to intermediates cost him his place in the points. Kubica performed well during the 2007 season, finishing consistently in point scoring positions. At the Canadian Grand Prix Kubica had a serious crash approaching the hairpin on lap 27, in which his car made contact with Jarno Trulli's Toyota, and hit a hump in the grass which lifted the car's nose into the air and left him unable to brake or steer. The car then hit the concrete retaining wall and rolled as it came back across the track, striking the opposite wall on the outside of the hairpin and coming to rest on its side. The speed measured when his car clipped the barrier was 300.13 km/h (186.49 mph), at a 75-degree angle, subjecting Kubica to an average deceleration of 28 g. After data from the onboard accident data recorder had been analysed it was found that he had been subjected to a peak G-force of 75 G. Under safety car conditions, Kubica was removed from the car and taken to the circuit's medical centre, where he was announced to be in "stable" condition. Shortly afterwards, his manager Daniele Morelli said Kubica was conscious and talking. It was initially reported that Kubica could have a broken leg. However, Mario Theissen later confirmed that he was not seriously injured. Further reports from late evening on race day, directly from the hospital, confirmed that Kubica had suffered a light concussion alongside a sprained ankle. After being kept in overnight for observation, Kubica left hospital the following day. On 14 June it was announced that as a precaution, Kubica would not race at the United States Grand Prix and would be replaced by test driver Sebastian Vettel. After missing Indianapolis, he returned for the French Grand Prix where he qualified and finished in fourth place, receiving ITV broadcaster Martin Brundle's driver of the day award. He then went on to finish fourth again at the British Grand Prix. Kubica's retention as race driver for 2008 was confirmed on 21 August 2007. Over the first half of the season, Kubica qualified and finished strongly, including his and BMW Sauber's first pole position at the Bahrain Grand Prix and second-place finishes at the Malaysian and Monaco Grands Prix. Kubica achieved the first win of his F1 career at the 2008 Canadian Grand Prix. On 8 June 2008 at the Canadian Grand Prix, Kubica achieved his first Formula 1 victory. He started second on the grid and passed race leader Lewis Hamilton in the first round of pitstops after the BMW Sauber pit crew completed a faster pitstop. On leaving the pits, Kubica and Kimi Räikkönen's Ferrari halted at the pit lane exit, waiting for the red pit exit light to change. Hamilton, running immediately behind them, missed the light and crashed into Räikkönen's Ferrari, eliminating both cars from the race. Kubica rejoined the race well positioned for the eventual victory. He passed Heidfeld's sister BMW Sauber, running one refuelling stop to Kubica's two stop strategy, and gained the necessary 24 seconds over Heidfeld to ensure that he maintained the lead after his second stop 22 laps later. The BMW Saubers remained first and second to the end of the race. Kubica later joked that he should thank Hamilton for electing to crash into Räikkönen instead of him. The win gave Kubica the lead in the Drivers' Championship. BMW Sauber's results were weaker over the second half of the season. At the French Grand Prix at Magny-Cours, Kubica finished 5th, reporting that this was a lost race, complaining about aerodynamic problems with the car. Kubica's strongest result of the latter part of the year was in Japan where he qualified sixth. At the start, several drivers braked too late for the first corner. Kubica took an inside line overtaking several cars and emerged in the lead. He led for 16 laps, but lost his lead to Fernando Alonso at the first round of pit stops. Kubica finished second after defending his position towards the end of the race against Räikkönen in a faster Ferrari (his fastest race lap was 0.6 seconds quicker than the Pole's) Apart from that, Kubica achieved podiums in a race in Valencia and in the rain affected race at Monza. Kubica finished the year fourth in the Drivers' Championship. At the 2009 season opener in Melbourne, Kubica qualified fourth on the grid. During the race, he was in third place and closing the gap to the front two cars before making contact with Sebastian Vettel while trying to overtake him. After the incident, Kubica continued briefly, but crashed into a wall at the next corner because his front wing had become stuck under the car. Vettel was later deemed responsible for the accident, and given a 10-place penalty on the grid for the next race in Malaysia. BMW motorsport director Mario Theissen claimed that Kubica would have won the race ahead of Jenson Button had it not been for Vettel. At the Malaysian Grand Prix, Kubica qualified in eighth place, but was promoted to sixth following Vettel's ten-place grid penalty for causing the crash in Australia, and Rubens Barrichello's five-place grid drop for changing his gearbox. However, he retired very early in the race with engine problems. The next two races, the Chinese Grand Prix and the Bahrain Grand Prix were disappointing for the BMW Sauber team as both Kubica and his teammate Heidfeld finished outside the points with a non-competitive car. For the next race in Barcelona, BMW Sauber prepared a modified version of the F1.09. The car proved more competitive but a mistake in fitting the tyres to Kubica's car during Q3 meant he could only qualify in 10th position. In the race, after a bad start (due to a clutch issue) he finished once more out of the points. Kubica suffered from an engine failure during second practice in Monaco, and retired from the Grand Prix due to a brake issue. At the Turkish Grand Prix, the team introduced the double diffuser. The car's performance improved and Kubica managed to score his first points of the season with a 7th place. In the next 3 races both BMW Sauber drivers finished outside the points again, but during the European and Belgian Grands Prix again proved to be competitive, scoring 8th and 4th positions respectively. In Italy, Kubica suffered engine trouble in qualifying and then retired from the race due to an oil leak. At the Singapore Grand Prix, Kubica finished 8th, defending his position from Kazuki Nakajima and Räikkönen in the last laps. He later stated it was "the most difficult point I have ever scored". At the Brazilian Grand Prix, Kubica scored his first podium of the season despite engine temperature problems by finishing in 2nd place, 7.6 seconds behind winner Mark Webber. The podium was BMW's second of the season. On 29 July 2009, BMW announced that they would leave Formula One at the end of 2009, which made Kubica a free agent for the 2010 season. For the 2010 season, it was announced that he had signed for Renault F1, the team he tested for during his junior career. Kubica driving for Renault at the 2010 Bahrain Grand Prix, the opening round of the season. Kubica moved to the Renault team for 2010. His position was briefly put in doubt, however, by the team evaluating its future in the sport following the 2009 season in the wake of the "Crashgate" scandal and the parent company's financial problems. This resulted in a Luxembourg-based investment firm, Genii Capital, taking a 75% stake in the team; Renault retaining the remaining 25%. Eric Boullier was also appointed as the new team manager. Kubica said he might not stay with Renault, as his contract was only valid if the parent company had a controlling stake in the team, but he then decided to remain with them. On 31 January 2010, it was announced that Vitaly Petrov was to be Kubica's teammate. It was reported in Autosport that Ferrari driver Felipe Massa had until the 2010 British Grand Prix to prove the Maranello outfit that he is worth hanging onto or Kubica could take his seat in 2011. However Ferrari re-signed Massa for 2011, leaving Kubica without a seat at the Italian team. Kubica at the 2010 Malaysian Grand Prix as a Renault F1 Team driver. On 7 July 2010, it was confirmed that Kubica had extended his contract with Renault to 2012. Kubica scored both his and the team's best result of the year with second place at the Australian Grand Prix. At the opening race of the 2010 season in Bahrain, Kubica was tagged by Adrian Sutil and spun on the opening lap but recovered to 11th. At the next race in Australia, he finished second after starting in ninth position. Fourth in Malaysia and fifth in China left him in seventh place in the Drivers' Championship, 20 points behind championship leader Jenson Button. Kubica felt that had there not been a second safety car period in China he could have finished on the podium. In Spain he finished eighth, but followed this up with another podium in Monaco, holding third throughout after losing second at the start to Sebastian Vettel. At the Turkish Grand Prix, he was held up behind Nico Rosberg for the second time in the season after Malaysia, and finished sixth. In Canada, Kubica finished seventh after an eventful race and problems with tyre degradation which made his race difficult, but did set the first fastest lap of his career in the race's closing stages. He added a fifth in Valencia and seventh in Germany before taking his third podium of the season in Belgium. He was competitive throughout the weekend, qualifying third, and only a bungled pitstop cost him second to Mark Webber. In Singapore, he qualified eighth in front of Schumacher. During the late stages of the race, he was forced to pit from sixth place due to a puncture. He was released from the pits to twelfth place, but with the help from superior grip and a series of overtaking moves—his move against Sutil was favourably compared to the incident between Webber and Hamilton—was able to claim seventh place, ultimately gaining a place from his qualifying result. In Suzuka, he managed to trail the Red Bulls throughout the weekend and translated it into a strong third place in qualifying. However, despite getting a good start and overtaking Webber at the start of the race, but would retire during the safety car period after losing one of his rear tyres. Formula One journalist Mark Hughes remarked that Kubica was currently "arguably the best driver", considering the season so far. He emphasised Kubica's strong showing in tracks where Hughes believed that the differences in driver skills are able to overwhelm the differences in the capability of the cars; namely, Monaco, Spa and Suzuka. Kubica managed to finish on the podium behind the Red Bulls except in Suzuka where he was strong throughout the weekend nevertheless, despite retiring from the race through no fault of his own. Kubica was retained by Renault – rebranded as Lotus Renault GP through Lotus Cars sponsorship – into the 2011 season, again partnered with Petrov. He tested the team's new car, the Renault R31, for the first time in Valencia on 2 February. On the last day of testing in Valencia he set the fastest time of the session. On 6 February 2011, Kubica was injured in a crash on the first stage of the Ronde di Andora rally. He was driving a Super 2000-specification Škoda Fabia in Testico when his car left the road at high speed and hit a crash barrier, near the church of San Sebastiano. Kubica was trapped in the car for more than an hour before rescue workers were able to extricate him. He was flown by helicopter to Santa Corona Hospital in Pietra Ligure near Savona, where it was confirmed that he had suffered partial amputation of his forearm, compound fractures to his right elbow, shoulder and leg, as well as significant loss of blood. The severity of his injuries was the result of the crash barrier penetrating the car's cockpit, and hitting Kubica, while leaving his co-driver unscathed. Kubica underwent a seven-hour operation by seven doctors split into two teams, without complications. Two more lengthy operations to repair fractures to his leg, shoulder and arm were performed successfully a few days later. The condition of his hand was not clear for some time and as a result he missed the 2011 season. As he was unable to start the season, Lotus Renault signed his former BMW Sauber teammate Nick Heidfeld as his replacement on 16 February, while Kubica still remained signed with the team for the 2011 season. Bruno Senna replaced Heidfeld later in the season, at the Belgian Grand Prix. Kubica was released from hospital to begin his rehabilitation on 24 April 2011. 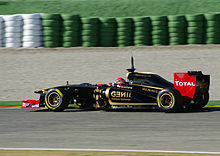 In November 2011 it was announced that Kubica would not be ready for the beginning of the 2012 season, forcing Renault (who at which point had changed their name to Lotus) to begin the season with two other drivers, Kimi Räikkönen and Romain Grosjean. In an interview in 2018 Kubica revealed that he had signed for Ferrari for the 2012 season. Kubica's recovery was dealt another setback after he re-broke his right leg, when he reportedly slipped on ice near his home in Italy, on 11 January 2012. He remained out of competitive racing for most of 2012, but returned to compete in the Ronde Gomitolo Di Lana in a WRC car on 9 September. He won the rally, finishing one minute ahead of the second placed driver. In 2013, Kubica continued his return, focusing on rallying. He drove for Citroën in the European and World Rally-2 Championships. His first event was the Rally de Portugal, in which he was competitive, but crashed and issues with his car led to him finishing in 6th. Then, at the Acropolis Rally, Kubica won, finishing nearly 90 seconds ahead of second placed Yuriy Protasov. He repeated this success at the Rally d'Italia winning ahead of Abdulaziz Al-Kuwari by 4 minutes. At the 2013 Rally Finland Kubica lost to Jari Ketomaa by nearly 90 seconds. The Rallye Deutschland was a big success. Not only did the Pole win ahead of Elfyn Evans by 12.9 seconds, he became the leader of the World Rally-2 Championships. He re-gained this position (Al-Kuwari became the leader in Australia) at the Rallye de France, again beating Evans, this time by 4 minutes. He won again at the Rally RACC Catalunya, his fifth victory of the season. With this result he was able to clinch the championship, as his nearest rival Al-Kuwari was too far behind to regain the first position in the championship. Kubica conducted a number of simulator tests with the Mercedes Formula 1 team which showed promise, but limitations in the range of motion of his injured arm would prevent him from driving in twisty circuits like Monaco due to the tight confines of an F1 cockpit. In 2014, Kubica started in the first round of the ERC season. He won the Internationale Jänner Rallye to claim his first victory in that championship, after coming very close on a number of occasions in 2014. His strong results in the stages for this rally eventually netted him the "Ice Master" trophy for the best driver in snow events that season. For the rest of the season, he participated in the main WRC class for the RK M-Sport, running as separate team, backed by Polish oil company Lotos. Kubica began his WRC campaign by taking the lead of the Monte Carlo Rally through the first two stages, but later retired on the second day after crashing out on SS9. Kubica suffered from a string of bad luck for the rest of the season, being fast on occasion but rarely managing to convert his speed into results. His best result was a 6th place at the Rally Argentina, a place lower than his highest finish in 2013 (5th in Germany) in a WRC-2 car. He finished the season in 16th place with 14 points. He finished the year on a positive note by winning the non-championship Monza Rally Show, beating motorcycle legend Valentino Rossi to second. After speculation following the 2014 WRC season, Kubica announced he would be racing in 2015, still running Ford Fiesta RS WRC and backed by Lotos, albeit no longer prepared by M-Sport. In 2016 due to a lack of funding his sole WRC rally was the Monte Carlo. In March 2016 he took part in the Mugello 12 Hours, a round of Creventic's International Endurance Series, in a GT3 Mercedes. In September 2016 he competed in the Renault Sport Trophy at the penultimate round of the season in Spa, Belgium. In January 2017, he took part in the first round of the 24H Series, the Dubai 24 Hour, driving a Förch Racing Porsche 911 GT3 in the A6-Pro class with co-drivers Robert Lukas, Marcin Jedliński, Wolf Henzler and Santiago Creel. This ended in retirement with undisclosed mechanical problems. On 2 February 2017, Kubica was signed by the ByKolles privateer LMP1 team in the FIA World Endurance Championship. This came after he tested their car in November 2016 during the WEC rookie test at Bahrain, and lapped faster than the team's regulars managed on the race weekend. Oliver Webb will remain with the team, with a third driver for the Nissan-powered CLM P1/01 yet to be named. After the pre-season testing at Italy's Autodromo Nazionale Monza, where Kubica did not do any running, the driver announced via social media that he would not be participating in the forthcoming season. On 2 May 2017, Kubica partook in an independently organised test of a Formula E car at Donington Park, with an aim of partaking in the New York ePrix. This failed to eventuate. On 5 June 2017, it was announced that Kubica would be driving in a Renault-organized test of their 2012 car, the Lotus E20, at Circuit Ricardo Tormo, his first Formula One event since his accident in 2011. Renault organised a further test, with Renault boss Cyril Abiteboul stating that 'he was still quick, still consistent and more importantly he still has the enthusiasm he always carried to the team'. He added that there were 'no obvious roadblocks' to an F1 return, and told NBC Sports that Kubica could be an option for 2018. On 24 July 2017, it was announced that Kubica would participate in the test for Renault, which would be held after the conclusion of the Hungarian Grand Prix. Abiteboul, Renault team's boss, said the test will allow the team to fully assess Kubica's current capabilities, and how likely he might be to "return to competition in the upcoming years". Kubica completed 142 laps of the Hungaroring on his return, finishing fourth-fastest nearly 1.5 seconds behind Sebastian Vettel. On 11 October 2017, Kubica completed a one-day test with Williams at Silverstone driving the 2014 FW36. On 17 October 2017, Kubica had a second day of testing with Williams at the Hungaroring. After Felipe Massa announced his retirement from the sport for the second time, Kubica became one of the top contenders to take his seat at Williams Martini Racing. He then tested for them at the Yas Marina Circuit following the 2017 Abu Dhabi Grand Prix, completing 100 laps in his first test with the team's 2017 FW40. He completed an additional 28 laps the next day and finished seventh fastest, with Willams technical chief Paddy Lowe reporting that "there are no issues around" his injuries, though doubts soon emerged about whether certain factors had made the times look better. On 16 January 2018, it was announced that Kubica would become the reserve driver of Williams for the 2018 season. He took part in his first Grand Prix weekend since the final round of the 2010 campaign, in Friday's first practice session at the 2018 Spanish Grand Prix, outperforming teammate Lance Stroll. Before the final round of the 2018 season Williams announced that Kubica would race full time for the team in 2019 where he will partner George Russell. He chose 88 as his driver number, last used by Rio Haryanto in 2016. † As Kubica was a guest driver, he was ineligible to score points. ^ "Williams announces Kubica as race driver for 2019". Retrieved 22 November 2018. ^ "F1 2019 driver and team line-ups". motorsport.com. Retrieved 3 December 2018. ^ Mitchell, Scott (11 July 2018). "Robert Kubica says he had signed F1 deal with Ferrari for 2012". Autosport. Retrieved 11 July 2018. ^ a b "Robert Kubica to miss start of 2012 season". BBC Sport. BBC. 23 November 2011. Retrieved 23 November 2011. ^ "Kubica undergoes emergency surgery after rally crash in Italy". CNN. Turner Broadcasting System. 6 February 2011. Retrieved 11 February 2011. ^ "F1 ace Kubica 'much better' after rally crash in Italy". CNN. Turner Broadcasting System. 7 February 2011. Retrieved 11 February 2011. ^ "Formula 1 driver Kubica targets quick return". The Sydney Morning Herald. Fairfax Media. 11 February 2011. Retrieved 11 February 2011. ^ "F1 return 'nearly impossible' – Kubica". ESPN F1. 12 November 2013. Retrieved 12 July 2014. ^ a b Green, Jonathan. "Robert Kubica has no 'obvious roadblocks' to F1 return, says Renault boss Cyril Abiteboul". Sky Sports F1. Retrieved 14 July 2017. ^ a b Barretto, Lawrence (16 January 2018). "Robert Kubica gets Williams Formula 1 development role for 2018". Autosport.com. Retrieved 16 January 2018. ^ Beer, Matt. "Robert Kubica wins domestic rally on return to competition". Autosport. Retrieved 12 March 2013. ^ "Kubica Victorious, But Physically Limited on Return". Crash.net. Retrieved 12 March 2013. ^ a b "Robert Kubica will star in rallying, according to Petter Solberg". Autosport. Retrieved 12 March 2013. ^ a b "Kosciuszko surprised at Kubica WRC decision". WRC. Retrieved 12 March 2013. ^ Beer, Matt (13 December 2013). "Robert Kubica commits to 2014 WRC with M-Sport". Autosport.com. Haymarket Publications. Retrieved 13 December 2013. ^ "Williams Martini Racing Confirms Robert Kubica as Race Driver for 2019". www.williamsf1.com. Retrieved 22 November 2018. ^ "Villeneuve feels let down by BMW". GPUpdate.net. 7 August 2006. Retrieved 1 February 2011. ^ "Kubica to finish season with BMW". GPUpdate.net. 10 August 2006. Retrieved 1 February 2011. ^ "Reaction: Toyota, Red Bull and Honda". sportinglife.com. 10 June 2007. Archived from the original on 30 September 2007. Retrieved 11 June 2008. ^ "Kubica's crash data disclosed". autosport.com. 20 June 2007. Retrieved 20 June 2007. ^ Benson, Andrew; Orlovac, Mark (10 June 2007). "Canadian Grand Prix". news.bbc.co.uk. Retrieved 11 June 2007. ^ "UPDATE: Kubica has broken leg". crash.net. 10 June 2007. Archived from the original on 12 June 2007. Retrieved 10 June 2007. ^ "Unhurt Kubica to leave hospital on Monday". homeofsport.com. 10 June 2007. Archived from the original on 29 September 2007. Retrieved 10 June 2007. ^ "Kubica 'feels ready for US race'". BBC Sport. BBC. 13 June 2007. Retrieved 6 February 2011. ^ "Kubica leaves hospital after crash in Montreal". iht.com. 11 June 2007. Retrieved 11 June 2007. ^ "Vettel to replace Kubica at Indianapolis". autosport.com. 14 June 2007. Retrieved 14 June 2007. ^ "Heidfeld and Kubica stay at BMW". news.bbc.co.uk. 21 August 2007. Retrieved 21 August 2007. ^ "Kubica targets F1 title after win". BBC News. 8 June 2008. Retrieved 22 May 2010. ^ Tremayne, David (9 June 2008). "Kubica celebrates first win as Hamilton rues pit-stop shunt". London: The Independent. Retrieved 22 May 2010. ^ "2008 Formula 1 Fuji Television Japanese Grand Prix – Fastest Laps". www.formula1.com. Retrieved 16 October 2008. ^ Benson, Andrew (12 October 2008). "Japanese Grand Prix". BBC Sport. Retrieved 12 October 2008. ^ "Australian GP – Sunday – Team quotes". grandprix.com. 29 March 2009. Retrieved 13 April 2009. ^ Elizalde, Pablo (29 March 2009). "Vettel gets grid penalty for Malaysia". autosport.com. Haymarket Publications. Retrieved 13 April 2009. ^ "Vettel gets 10-place grid penalty". BBC Sport. BBC. 29 March 2009. Retrieved 3 April 2009. ^ "Spanish Grand Prix – selected driver quotes". formula1.com. Formula One Administration. 10 May 2009. Retrieved 3 April 2010. ^ Elizalde, Pablo (27 September 2009). "Kubica: The most difficult point ever". autosport.com. Haymarket Publications. Retrieved 3 April 2010. ^ Beer, Matt (7 October 2009). "Kubica joins Renault for 2010". autosport.com. Haymarket Publications. Retrieved 3 April 2010. ^ Noble, Jonathan (29 July 2009). "BMW will quit F1 at the end of 2009". autosport.com. Haymarket Publications. Retrieved 3 April 2010. ^ Strang, Simon (20 August 2009). "Kubica "open-minded" on 2010 options". autosport.com. Haymarket Publications. Retrieved 3 April 2010. ^ Benson, Andrew (10 December 2009). "Deal struck to keep Renault in F1". BBC News. Retrieved 22 May 2010. ^ Benson, Andrew (16 December 2009). "Kubica may not stay with Renault". BBC News. Retrieved 22 May 2010. ^ Benson, Andrew (4 January 2010). "Kubica to stay with Renault team". BBC News. Retrieved 22 May 2010. ^ Straw, Edd (8 April 2010). "Massa fights for Ferrari future". Autosport. Vol. 200 no. 2. Haymarket Publications. pp. 10–11. ^ Collantine, Keith (7 July 2010). "Kubica extends Renault deal to 2012". F1 Fanatic. Keith Collantine. Retrieved 19 October 2010. ^ Noble, Jonathan (14 June 2010). "Kubica eyes step forward in Valencia". autosport.com. Haymarket Publications. Retrieved 1 September 2010. ^ Hughes, Mark (12 October 2010). "Why Robert Kubica is arguably the best driver in F1". BBC Sport. BBC. Retrieved 19 October 2010. ^ a b "Petrov to sample new Renault first". crash.net. Crash Media Group. 26 January 2011. Retrieved 27 January 2011. ^ "Renault's Kubica leads field as test ends". Formula1.com. Formula One Administration. 3 February 2011. Retrieved 5 February 2011. ^ Beer, Matt; Noble, Jonathan (6 February 2011). "Kubica hospitalised after rally crash". Autosport. Haymarket Publications. Retrieved 6 February 2011. ^ "Andava veloce ma ero convinto non-sbandasse". La Stampa (in Italian). Editrice La Stampa. 10 February 2011. Archived from the original on 22 July 2011. Retrieved 27 February 2011. ^ "Testico Gli Abitanti: Come ex voto potrebbe riparare il tetto della Chiesa "San Sebastiano l'ha salvato"". La Stampa (in Italian). Editrice La Stampa. 10 February 2011. Archived from the original on 22 July 2011. Retrieved 27 February 2011. ^ "Una sequenza di sei curve pericolose". La Stampa (in Italian). Editrice La Stampa. 8 February 2011. Archived from the original on 22 July 2011. Retrieved 27 February 2011. ^ a b c Strang, Simon; Lostia, Michele (7 February 2011). "Kubica to undergo second surgery". Autosport. Haymarket Publications. Retrieved 7 February 2011. ^ "Pietra Ligure il pilota migliora dopo il lungo intervento di Venerdi' Riabilitazione al simulatore del S. Corona Lo staff di Kubica ha visionato e "promosso" il sistema robotico di Unita' spinale". La Stampa (in Italian). Editrice La Stampa. 13 February 2011. Archived from the original on 22 July 2011. Retrieved 27 February 2011. ^ "Formula 1 driver Robert Kubica injured in rally crash". BBC Sport. BBC. 6 February 2011. Retrieved 6 February 2011. ^ Noble, Jonathan (6 February 2011). "Kubica suffers multiple fractures". Autosport. Haymarket Publications. Retrieved 6 February 2011. ^ Elizalde, Pablo (17 February 2011). "Kubica undergoes final surgery". Autosport. Haymarket Publications. Retrieved 17 February 2011. ^ Lostia, Michele; Beer, Matt (12 February 2011). "Kubica requires one more operation". Autosport. Haymarket Publications. Retrieved 12 February 2011. ^ "Robert Kubica faces elbow surgery as fears grow he may lose use of hand". Metro. Associated Newspapers. 14 February 2011. Retrieved 15 February 2011. ^ Noble, Jonathan; Lostia, Michele (6 February 2011). "Kubica could be sidelined for 2011". Autosport. Haymarket Publications. Retrieved 6 February 2011. ^ Noble, Jonathan (7 February 2011). "Kubica's condition is 'stable but serious'". Autosport. Haymarket Publications. Retrieved 6 February 2011. ^ "Renault confirm Heidfeld as Kubica stand-in". formula1.com. Formula One Administration. 16 February 2011. Retrieved 16 February 2011. ^ "Kubica discharged from Italian hospital". formula1.com. Formula One Administration. 24 April 2011. Retrieved 26 April 2011. ^ Benson, Andrew (11 January 2012). "Robert Kubica breaks right leg in accident". BBC Sport. BBC. Retrieved 11 January 2012. ^ "Robert Kubica breaks right leg in accident". BBC News. 11 January 2012. Retrieved 11 January 2012. ^ "F1 Return for Kubica Uncertain – Alonso". The Motor Report. The Motor Report Pty Ltd. GMM. 22 August 2012. Retrieved 22 August 2012. ^ Beer, Matt (9 September 2012). "Robert Kubica wins domestic rally on return to competition". Autosport. Haymarket Publications. Retrieved 15 December 2012. ^ "Kubica: F1 return nearly impossible". Autosport. crash.net. 12 November 2013. Retrieved 11 January 2014. ^ Evans, David. "Ex-F1 driver Robert Kubica set to exit WRC after Monte Carlo Rally". ^ "First-lap clash disrupts Robert Kubica's circuit racing return". ^ "Kubica to race in Renault Sport Trophy". ^ "24H SERIES 24H DUBAI 2017". 24H SERIES. Retrieved 19 December 2017. ^ Klein, Jamie. "Ex-F1 driver Robert Kubica to race in WEC with ByKolles LMP1 team". Autosport.com. ^ "Robert Kubica". facebook.com. Retrieved 23 April 2017. ^ "Kubica tests Formula E car at Donington Park". 3 May 2017. Retrieved 4 May 2017. ^ Chinchero, Roberto (5 June 2017). "Robert Kubica set for first F1 test since accident in 2012 Lotus". Autosport.com. Retrieved 6 June 2017. ^ "Kubica to drive 2017 Renault in F1's post-Hungary test". formula1.com. 24 July 2017. Retrieved 24 July 2017. ^ "Kubica fourth fastest on return as Vettel sets testing pace". formula1.com. Retrieved 9 September 2017. ^ "Kubica completes 'successful' test with Williams". formula1.com. Retrieved 12 October 2017. ^ "Kubica completes 'successful' Williams test". GPUpdate.net. Retrieved 12 October 2017. ^ "Kubica completes 'productive' second test with Williams". formula1.com. Retrieved 18 October 2017. ^ "Massa to retire at end of 2017 F1 season". Formula1.com. Formula One World Championship Limited. Retrieved 25 November 2017. ^ GMM (26 November 2017). "Robert Kubica still needs FIA clearance for F1 return". Autoweek. Crain Communications. Retrieved 28 November 2017. Toto Wolff, who is pushing Williams to take Mercedes junior Pascal Wehrlein, insists that Kubica is the clear favorite. ^ Gilboy, James. "Williams F1 Confirms Robert Kubica Will Drive Abu Dhabi Test". The Drive. Retrieved 25 November 2017. ^ Barretto, Lawerence (28 November 2017). "Kubica logs 100 laps in first test with 2017 Williams". Motorsport.com. Motorsport Network. Retrieved 28 November 2017. ^ Barretto, Lawerence (28 November 2017). "Kubica: "I'm not driving one-handed"". Motorsport.com. Motorsport Network. Retrieved 28 November 2017. ^ "Vettel finishes F1 tyre test on top, Kubica seventh". Motorsport.com. Motorsport Network. 29 November 2017. Retrieved 29 November 2017. ^ Saunders, Nate (29 November 2017). "Williams says there are 'no issues' with Robert Kubica limitations". ESPN UK. ESPN Internet Ventures. Retrieved 29 November 2017. ^ "Doubts emerging to derail the Kubica F1 comeback 'hype train'". nbcsports.com. 5 December 2017. Retrieved 8 March 2018. ^ "Robert Kubica: 2018 Williams F1 car not enjoyable to drive in Spain FP1". Autosport.com. Autosport. Retrieved 11 May 2018. ^ "Robert Kubica: Polish driver to make F1 comeback with Williams in 2019". BBC Sport. 22 November 2018. Retrieved 22 November 2018. ^ "2003 Macau Formula 3 Grand Prix Entry List". macau.grandprix.gov.mo. Macau Grand Prix. Archived from the original on 22 July 2011. Retrieved 5 February 2010. Wikimedia Commons has media related to Robert Kubica.